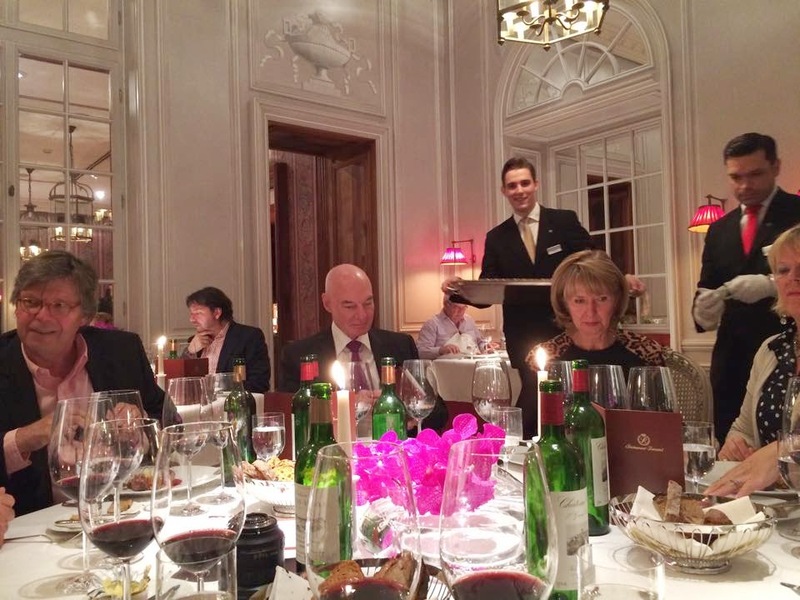 At the end of October, 2014, Panos Kakaviatos was on his annual winemaker dinner tour in Germany, this time with John Kolasa and with stops in Munich and Frankfurt. Following Angelus, Pichon-Comtesse, Palmer, Sociando-Mallet and Leoville-Poyferre in previous years, he presented Château Canon und Château Rauzan Ségla, both managed by John Kolasa. 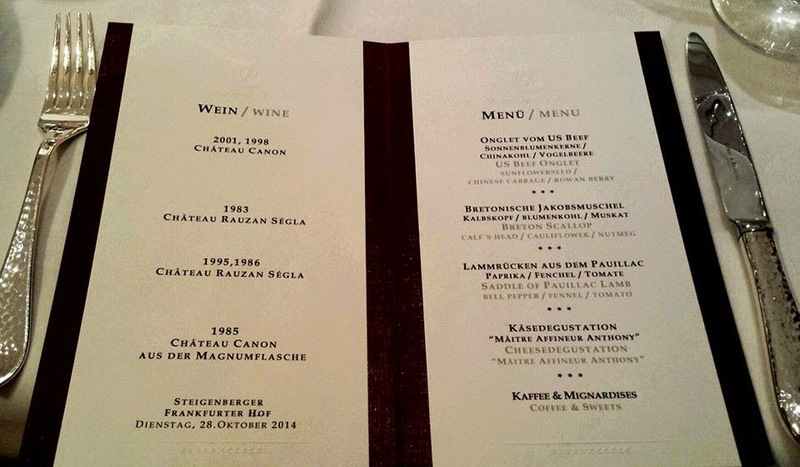 I attended with Annette Schiller the Frankfurt dinner at Restaurant Le Français (1 Michelin-Stern, 17 Punkte Gault Millau) at the im Steigenberger Frankfurter Hof Hotel. Annette Schiller from ombiasy PR and WineTours provided the tasting notes for this posting. Panos Kakaviatos is a highly respected Bordeaux expert, who regularly writes for the Decanter, Harpers Wine & Spirits – two excellent UK based wine magazines - and other wine publications. I first met Panos Kakaviatos in Washington DC at one of the wine events he organized in the USA. Subsequently, we spent an evening together at our house, which is close to where Panos grew up. Born, raised and educated in Washington D.C. to Greek parents, he speaks English, but he is also fluent in German and French. As these are the three languages I also master, we switched back and forth between English, French and German, depending on the subject we are discussing. Panos recently created a new web site – wine-chronicles.com - where he introduces himself: I have been a published wine writer since about 2001. Since then, I have organized wine tastings for hotel restaurants mainly in Germany but also in the US and even once in Dubai, been invited to judge at professional tastings and basically love to drink wine! Wine is much more about point scores and evaluations. It is about the people who are associated with it, the regions where it is made, the anecdotes – sometimes amusing, sometimes less so – that you experience. Above all, it is about conviviality and stories. Or solitude. The cliché is that wine is meant to share with friends. Of course that is probably the best way to enjoy it. But how often do you enjoy a glass (or two) on your own? Wine Chronicles is about communicating stories about wine – and around wine. Wine Chronicles will share stories from other bloggers and wine lovers, too, to reflect what long has been turning into a worldwide passion. Online groups such as #winelovers flourish. More people are educating themselves, formally or not. And more people are buying and drinking wine. So in addition to my texts and tasting notes, you will find links to other blogs – at least that is the idea. Where do I fit into this picture? For years, I have held a professional passion about wine, writing articles in internationally recognized media such as Decanter, Harpers Wine & Spirit, Wine Business International, Wines & Vines, France Today, France Magazine and others. My writing ability was developed as a news agency reporter, primarily with the Associated Press. More recently, I have been associated with Europe’s premier human rights organization The Council of Europe, where I work in media relations. My contractual arrangement with the Council of Europe permits me to pursue my wine passion – and I have most recently been organizing wine tasting dinners as an educator and participated as a judge in international wine competitions, from Shanghai to London. As you can see in my CV, I am available as a judge for other wine competitions and can provide clients – from restaurants to individuals – with cellar consulting. As an experienced wine steward, I know how to manage a restaurant cellar. Another service I can provide for you is tour organization, especially for the wine country I know best: France. Restaurant Francais is part of Steigenberger Hotel Frankfurter Hof. It is an old-style hotel, with high ceiling, lots of marble and gold elements, including in the restaurant. The very charming and welcoming staff makes you feel at ease in this majestic décor. The restaurant could easily be in Paris. Chef Patrick Bittner worked with Dieter Müller before taking over in Frankfurt. He was awarded his first Michelin Star in 2008. Michelin: Patrick Bittner and his experienced team continue to hone their skills, bringing clever modern techniques and interesting textures to their classic cuisine. Suitably elegant dining room complete with fireplace and winter garden. If you like eating outside, the main courtyard makes a perfect terrace. John Kolasa is the Managing Director of Chateau Rauzan-Ségla in Margaux and at Chateau Canon in Saint-Emilion. Born in Scotland, John Kolasa’s Francophilia (and first career as a French teacher) brought him to Bordeaux in 1971. It was his desire to start a new adventure that he met Englishman William Bolter and American Steven Schneider who owned a wine company. His career in wine began with work on the quays in Bordeaux and a year of weekly oenology studies. After four years with Bolter and Schneider, John Kolasa began looking after properties belonging to the Janoueix family in Saint-Emilion and Pomerol, followed by two years with the Union des Producteurs in Saint-Emilion. In 1987, he was asked to take over the commercial manager position at Chateau Latour in Pauillac. Remaining at Latour until 1994, John Kolasa’s new challenge began when the Wertheimer family, the owners of Chanel, acquired Chateau Rauzan-Ségla and he was brought on to oversee the operation at the chateau and rebuild the reputation of what was known in the 19th century as the best of the second growths. Following this initial acquisition, in 1996 the Wertheimer family decided to purchase Chateau Canon, a first growth in Saint-Emilion on the right bank of Bordeaux. John Kolasa has overseen the extensive renovation program that was undertaken to reveal the finesse and elegance of its terroir and bring back the great wines of Chateau Canon. In 2011, Canon purchased Chateau Matras, Grand Cru Classé to add to the production of its second wine, Clos Canon. John Kolasa lives in Margaux with his wife, Delphine, and has four children, Claire, Helene, Elise, and Victor. Château Canon is located southwest of the Saint-Émilion village, neighbouring Château Magdelaine, Château La Gaffelière and Château Ausone. It is a Premiers Grands Crus Classés B in the Classification of Saint-Émilion. In the late 1700s, the estate - named Clos St-Martin - was sold to Jacques Kanon, probably the source of the name Canon. A true clos, the original 12 hectare vineyard was encircled by a wall, which Jacques Kanon expanded by acquiring seven small surrounding vineyards. The estate went through several ownerships, until it was sold to the Wertheimer family in 1996. Today, the vineyard area totals 21.5 hectares, with Merlot accounting for 60% and Cabernet Franc for 40%. On average, the vines are 25 years old. Chateau Canon annually produces on average 7,500 cases of the Grand Vin Chateau Canon and the second wine Clos de Canon. Château Rauzan-Ségla is a Deuxièmes Crus in the Classification of 1855, located in the Margaux appellation. Château Rauzan-Ségla was once part of the vast Rausan estate owned by Pierre de Mesures de Rauzan in the mid-17th century. Over time, this estate was divided, and by the time of the 1855 Classification, had been separated into the estates of Château Rauzan-Gassies, Château Rauzan-Ségla, Château Desmirail, and Château Marquis de Terme. After a long ownership by the Durand-Dasier family, the estate was acquired by Frédéric Cruse of the Cruse family in 1903 who held ownership until 1957. Liverpool shipping magnate John Holt and Brent Walker followed as owners, before the Wertheimer family bought the estate in 1994. The vineyard area totals 51 hectares, with Cabernet Sauvignon accounting for 61%, Merlot for 35% and Cabernet Franc and Petit Verdot for 2% each. The Grand Vin is Château Rauzan-Ségla, with an annual production of 8000 cases. The second wine is named Ségla. Annette Schiller took notes during the dinner and provided the tasting notes. Annette is founder and CEO of ombiasy PR and WineTours. Her speciality are wine tours to Bordeaux and Germany. See here, for example: Bordeaux Wine Tour 2013 by ombiasy. For the Bordeaux Wine Tour by ombiasy coming up in 2015, see: ombiasy PR and WineTours. The winemaker dinner was 189€, including tax and tip. This evening was a wonderful comparison between Bordeaux Right Bank vs. Bordeaux Left Bank. All wines were decanted well ahead of time. Château Canon 2001 and 1998. Both Saint-Emilion wines, from the same Château, and John Kolasa was already on the ground when those wines were produced. However the wines were completely different due to the very different climate conditions in 2001 and 1998. 2001: This was overall a “cool” year and the wine was carried more by the Cabernet-Franc. On first sight the bouquet jumped out of the glass. It was gorgeous with a seductive nose of fruit, -cassis and cherry- , ripeness, and hints of pepper and spice. It almost smelled like a new world style wine. This wine had a generous texture, and showed harmony between the pronounced tannins, layers of different flavors, and acidity. I was very much taken by the first impression and elegance of this wine. But somehow, after sitting in the glass for a while, the bouquet weakened considerably and the wine fell kind of flat. 1998: This was overall a “warm” year and the wine was carried more by the Merlot. On the first encounter the nose was very restrained, but the voluptuousness of the Merlot counterbalanced the coyness of the wine on the palate. After a while in the glass the nose came forward with hints of dark fruit, some vanilla, and a bit of smokiness. There was a pleasant velvety mouthfeel with a good tannin structure and acidity, which lingered on. This wine was more complex, more astute than the 2001, and had definitely more elegance. It is good to drink now but I believe that the wine can still last a long time. Both wines were a good match with the beef and how it was prepared. This wine was dark, almost brownish in the glass. The nose was glorious, wide open, rich, fruity, - lots of cassis -, earthy, and a bit meaty. It was a powerful wine with a perfect structure and tannin - flavor - acidity - balance, a creamy texture, and endless finish. The wine was bold, but at the same time very stylish and classy. It was hard to believe that this wine was more than 30 years old. The pairing with the food course was absolutely stunning. Scallops and calf’s head, this was an extraordinary combination beautifully executed and the two 1983 Rauzan-Ségla could not have been a more perfect match. The hint of meatiness in the wine and the hint of meatiness in the food as well as the creaminess of the wine and the creaminess of the sauce were just the perfect marriage. These wines were much more similar than the two Canon wines of the first flight. Both showed the characteristics of classic Bordeaux of the Left Bank. 1995: This was the first wine John Kolasa made after he joined Château Rauzan-Ségla. 1995 was also a “warm” vintage with an early ripening and an early picking period, favorable for the Cabernet-Sauvignon, which is the dominate grape varietal in the Rauzan-Ségla wines. The wine was dark colored, a red-purple beauty in the glass. On the nose, which was not overbearing, it showed pronounced cassis, smoke, and a hint of pine. This was a full-bodied, fat, complex wine with powerful tannins, and a long aftertaste. The wine had a touch of rambunctiousness paired with a certain elegance, and a still youthful freshness. I liked the tension in the wine and I am sure that one can keep it for a long time. 1986: This wine also had a beautiful dark, red-purple color in the glass. It was a bit tight on the nose, but after a while in the glass the bouquet opened up and gorgeous dark berry fruit notes paired with earthy, and smoky notes appeared. On the palate it was dense, yet there was harmony between tannins, fruit flavors, spices, and acidity, and it had a nice length. I am not sure if one should keep it much longer. Both wines paired beautifully with the lamb. The character of the wines were an ideal match with the spices, and the flavor of the lamb. In the early 80s many vineyards at Canon were redeveloped and the 1985 vintage bears fruit from the new plantings. The wine was ruby-red in the glass and the nose was gorgeous: aromas of cherry, earth, some herbal notes, leather. The body had medium weight. This is a harmonious wine with the tannins completely integrated. On the palate the wine was mature, creamy, but also with a surprising freshness, and a lingering finish. What a joy to drink this wine now. The selection of cheeses, Epoisse, Comté, a mild chèvre, was perfect for this wine. I missed a blue cheese, which I love, on the cheese platter, but that would not have paired at all with the wine. The mild cheeses, all had a creaminess in the mouth, were a perfect match for this elegant wine. Thanks Panos and John for a wonderful evening. In October 2014, I spent a month in Singapore, visiting my daughter, son-in-law and granddaughter Viatrix. During these 4 weeks, I explored with my wife Annette Schiller the wine scene of Singapore, including the wine bar scene. 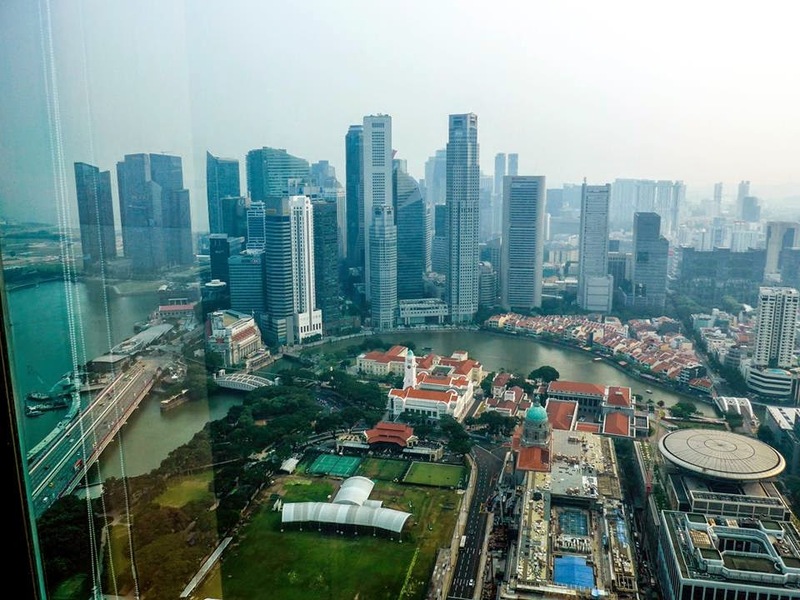 During my 30 years career at the IMF, I visited Singapore from time to time and knew my way around, when I came to Singapore this time. Singapore - known as The Little Red Dot - covers just 700 square km and has a population of a bit more than 5 million people. It is a very expensive city (and became the most expensive city in 2014 according to the Economist) and also a popular tourist destination; on average every day, there are 36,000 additional people on the island. Who’s buying? 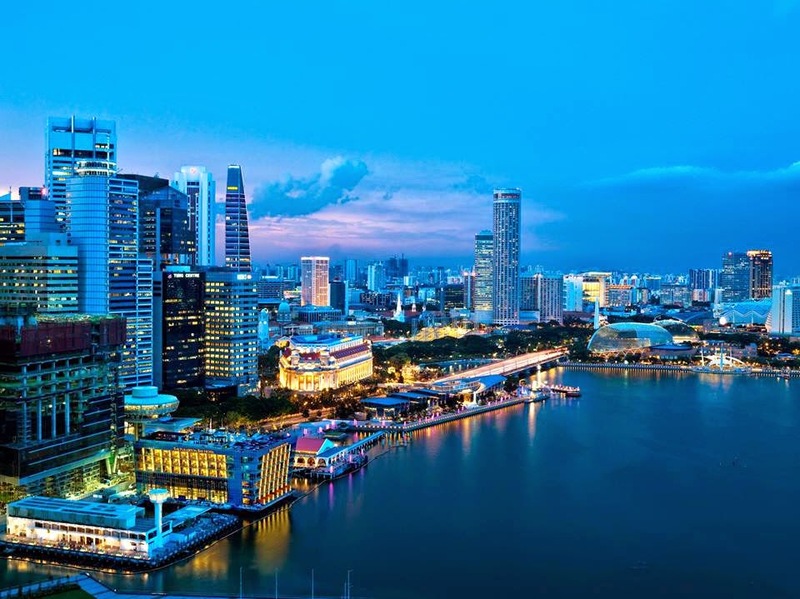 With US 55.000, Singapore has a higher per capita income than Germany and the US, for example. On the supply side, the number of importers has mushroomed in recent years. Berry Brothers and Rudd moved into Asia in 1998, establishing offices in Hong Kong, Shanghai and Japan, is now also present in Singapore. Berry Brothers and Rudd predicts that its Asia businesses will account for half its global sales in five years’ time, up from 15% currently. thedrinksbusiness.com: Not so long ago finding a good quality wine bar in Singapore might have been a hard task, but not anymore. While it may not produce any of its own wines, Singapore is home to a passionate wine community and thriving fine wine market. Over the last three years the popularity of wine bars has grown with many former retail shops converting into licensed outlets. From fine wine bars to humble street bars, today the wine connoisseur in Singapore has a variety of specialist wine outlets to explore – assuming it benefits from an in-house sommelier. Many offer wine by glass – which could be the key to their success – allowing consumers to sample expensive wines without having to stump up the cost of a bottle. A very special wine bar, off the beaten track. No wines by the glass, no food, but an extraordinary wine list, including a sensational selection of German wines. The wine bar is owned and run by, Tan Ying Hsien, who is enrolled (and pretty advanced as far as I know) in the Master of Wine program. I was in particular impressed by the extensive availability of wine verticals (wines from the same producer and vineyard with differing vintages), including from Reichsgraf von Kesselstatt with a dozen wine verticals dating back as far as 1983. Thewanderingpalate.com: PS, this is the Wandering Palate’s favourite wine bar in Singapore, away from all the boozing crowds on the Quay’s and pedestrian bar strips, this is a very civilised and cosy wine bar tucked away in Binjai Park (off Dunearn Road). The wine list is extraordinary – a very personal (cellar) selection with some of the world’s greatest producers, at the same time always same amazing discoveries and bargains that Ying has unearthed – One frequently hears that the Singapore wine consumer is purely obsessed with super-fine wine and yet whenever I am at Taberna, I always see the patrons enjoying modest and obscure wines from all over the world – thanks to Ying’s ever-inquisitive palate. Lovely wine bar with an excellent and large selection of Bourgogne and Bordeaux wines. Enomatic machine. 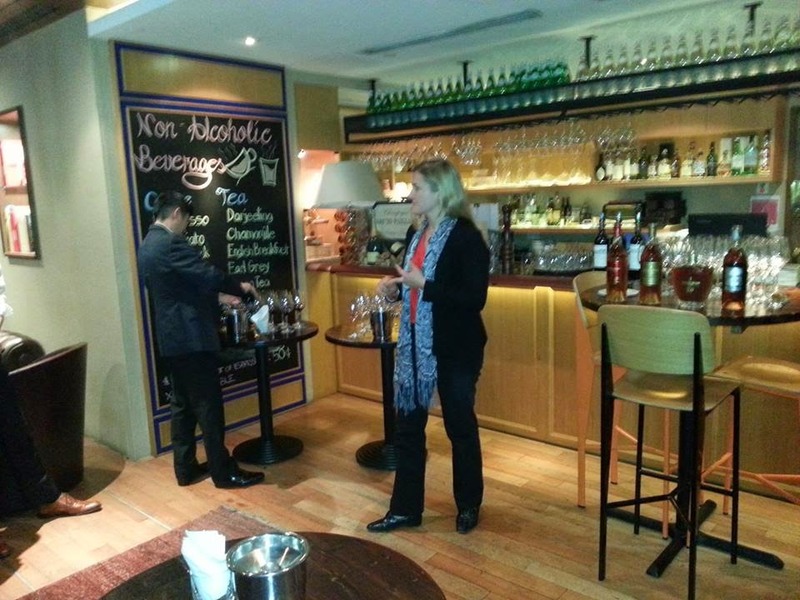 Chateau Pontet-Canet & Tesseron Cognac owner Melanie Tesseron was here for a tasting earlier this year. Thedrinkbusiness.com: Caveau Wines & Bar is a joint retail outlet and wine bar and café owned by the Les Amis Group and Vinum Fine Wines offering a one stop spot for all your wine needs – whatever time of day. Its retail shop features more than 400 wines starting from SGD$30 a bottle served from Enomatic Elite wine dispensers allowing guests to sample up to 16 wines at any one time. Caveau Wines & Bar also runs coffee shop with fresh coffee and pastries. From 5pm the café transforms into a wine bar complemented by a bar menu serving both French and Vietnamese cuisine selected by sommeliers to pair with the wines on offer. Not a wine bar for a serious wine drinker. But fun place, if you are in the area. Citynomads.com: With free flow wine at $18+ from 6-8pm daily, this wine deal is one of the most competitive in town. Although the free flow doesn’t feature their best wines, they do have a range of decent wines at affordable prices, available to choose from their cellar - so you can pop by and pick and appreciate the wine yourself. This place has been popular in it’s neighborhood for some time and with a live band in the loft, an alfresco area outside for some casual dining, a Middle Eastern style attic for privacy and not to mention $9+ steaks on Saturdays.. we understand why Wine BOS is perfect for an affordable chill. 20 wines by the glass, including Von Unserem, Weingut Balthasar Ress, Rheingau, Germany. 200 wines by the bottle, good selection of Bordeaux wines, very substantial wine list, focusing almost exclusively on old world wines, including – and this is rare – Swiss wines. The whole place is more like a lounge area, but you can also eat. Hungrygowhere.com: Welcome to Wine Universe, where a treasury of wines from all over the world await you! Located in a corner of Millenia Walk in Singapore, our restaurant glassy exterior with its sidewalk alfreasco lounge invites guests to step into its restaurant and wine bar. Not a wine bar, but an iconic place. Yoursingapore.com: The birthplace of the Singapore Sling, the Long Bar at Raffles Hotel is a step into nostalgia, housed in colonial architecture. Inspired by the plantations of 1920s Malaya, this two-story bar is the place to be if you want to taste Singapore’s signature cocktail. Other than the Singapore Sling, traditional pub snacks are also available during lunch. In the evening, you can enjoy a live band performing contemporary and popular hits, while you enjoy the alfresco experience of the Long Bar. A very special place. Very quiet. Excellent and large selection of premium wines from around the world. The Devine Bar: The Divine Bar is situated near Kampong Glam opposite Raffles Hospital in Parkview Square office building. Locally known as the "Gotham building", Parkview Square was inspired by 1929 Chanin building in New-york and offers guests at The Divine Bar a unique Art Deco setting to unwind. The opulent bar prides itself for its high society experience with its gold and black outlay, chandeliers and plush sofas. With the light jazz playing on the background, you can chill out and really enjoy a conversation and if you order some wine, you'll be amazed by some flying angels' stunt as they scour through the racks for wines. Not a wine bar, but an authentic German beer tavern. Yoursingapore.com: A little slice of Bavaria can be found right next to Suntec Convention Centre in downtown Singapore. From its costumed staff and pork knuckles, to its beer brewed specially in-house, Paulaner Brauhaus gives you an authentic Bavarian dining experience. The restaurant offers traditional Munich dishes, like wiener schnitzel and brotzeibrettl, as well as other international staples. In keeping with the authentic Bavarian way, the big meals are even served in cast iron and wooden pans. A meal at Paulaner Brauhaus wouldn’t be complete with a tour of its very own house brewery, where you can learn exactly how the famous beers are made. No food, no wine by the glass, but ample space to sit down and relax. You can by wine by the bottle and order food from any restaurant in the neighborhood. Has a total of 12 retail wine bars in Singapore. The Straits Wine Company: Started in 2006, The Straits Wine Company is now Southeast Asia’s leading wine importer, retailer and distributor, with operations in Singapore, Malaysia and Philippines. Offering a bespoke 360 wine solution, The Straits Wine Company has a comprehensive range of services that caters to any and all wine needs. From private wine parties to cellar planning, a trusted bottle shop to private client concierge, the Straits team of wine professionals is at your disposal. Our 12 retail wine bars across Singapore showcase a wide range of wines from around the world including Australia, New Zealand, France, Spain, Italy, Argentina, Portugal, India, USA, Lebanon, Japan, Switzerland and many, many more. Whether you are wine beginner or an experience aficionado, we have a wine for you. French restaurant with wine bar, with an amazing selection of Tertre Roteboeuf wines and other wines of the Mitjavile family in Saint Emilion, imported directly. The main dining room is called Mitjavile Room. Absinthe.sg: Absinthe was created as a comfortable, convivial and unassuming place serving delicious and tasty dishes, not forgetting of course the extensive selection of reasonably priced wines covering most of France wine producing regions and a fair representation of others countries. Once in Absinthe make sure you do taste one of the Absinthes we have on offer and experience the "Green Fairy"! One of my favorites. Excellent selection of premium wines from Bourgogne and Bordeaux wines. Earlier vintages. Good food. A fun place with a good selection of very reasonably priced wines - 100 wines by the bottle, starting at $40 and going up to $100. 30 wines by the glass, including 2 Weingut Selbach Oster wines. Very reasonably priced wine and food lists. Always packed. There are 5 Wine Connection bars, including one focusing on cheese. CityNomadas.com: Wine Connection is an obvious choice but nonetheless deserves a spot on this list. It’s affordable, easy and the place is huuuuge. Wine prices start as low as $7 per glass at every hour.. not just happy hour. Wines by the bottle boast some of the lowest prices in town, starting at $25. If you’re a big cheese junkie, then scoot next door to their cheese bar for some delicious and affordable cheese, and of course yet more good wine. Not a wine bar, but a very charming bar by the Singapore River. citynomads.com: Not really a wine bar but we think eM deserves a mention for its happy hour promotion, from 5-9pm daily, offering $9 red and white wines and not to mention a great, secluded view of the river. This is perfect for date night or just having a quiet drink somewhere a little more chilled. urbanjourney.com: When it comes to great food and wine, you can’t go wrong with classic French bistro fare, which is why we were excited to visit the new-ish Fatien Bar a Vin in Robertson Quay. As we discovered, this charming 30-seater restaurant not only offers a relaxed and unassuming atmosphere, but it also offers fab food and wine at stellar prices. Newly opened in December by wine importer Jimmy Lopez, Fatien Bar a Vin is the more casual and cozy sister to La Masion Fatien of Duxton Hill. Although the place is small, the atmosphere is friendly and inviting. When we arrived, there were only a few tables dining and drinking, which made it easy to find a place to settle in and let the conversation flow. Rooftop bar of the Marina Bay Sands Hotel. You go there for the exceptional view and atmosphere. The wine list is top. 18 wines by the glass. 500 wines by the bottle. Most expensive: 1990 La Tache Domaine de la Romanee Conti S$12088. The Weingut Dönnhoff Riesling is available for S$99. I had a glass of Domaine Ott for S$22. The bar area is very nice and large. Its wine list has over 400 selections to choose from, including a nice list of wines from Germany. db Bistro Moderne: Located in the luxury retail and dining atrium of the Marina Bay Sands Resort Casino, just across from the Sands Theatre, db Bistro Moderne offers an exciting mix of traditional French bistro cooking with contemporary American flavors, and a world-renown collection of signature burgers. Chef Daniel Boulud reinterprets the classic Parisian bistro while sharing the energy and style of his acclaimed db Bistro Moderne in Midtown Manhattan. The striking, modern-bistro aesthetics include a stylish 15-seat bar as well as an informal lounge area for casual dining, a private room seating up to 20 is available for personal and business entertaining. Not a wine bar, but has a very good list of Italian wines and an outstanding view. Asia Bars and Restaurants: The Lighthouse Restaurant & Rooftop Bar inhabits the original lighthouse structure on the rooftop of Singapore’s colonial era General Post Office building- completely restored and operated since 2001 as the heritage-listed The Fullerton Hotel. The old lighthouse annex of the building was converted into the delightful The Lighthouse restaurant back in 2008- an elegant dining room of intimate proportions, combined with an open-air rooftop bar. With its unique location on Singapore’s Marina Bay waterfront, The Lighthouse is a wonderful destination to combine fine Italian dining with spectacular “postcard” views and rooftop drinks. Napoleon offers a stellar range of 32 European wines available on enomatic wine dispenser machines—one of which is the Châteauneuf-du-Pape Ancien Domaine des Pontifes 2011 ($18 per glass; $90 per bottle). Thedrinksbusiness.com: Napoleon offers a chance to sample up to 32 European wines by the glass in a cosy and comfortable atmosphere specifically paired with a variety of south European dishes interpreted by Singaporean chefs. The bar also puts on regular educational sessions on wine appreciation, wine pairing, fine spirits or mixology, as well as several interactive appreciation classes. One of my favorites. Perched on the corner of Club Street, this French wine bar serves a large range of French imported wines from $7 per glass and from $37 by the bottle. You do not find the high-priced ultra-premium wines that you find in many other Singapore wine bars, but an outstanding selection of reasonably priced good French wines. Ladyironchef.com: The French have a saying, ‘Life is too short to drink bad wine’. Believing in enjoying wine (without hefty price tags), French owner Antoine Rouland travels back to France three times each year to visit winemakers and vineyards, selecting wines from smaller producers. Here, you’ll find vintages such as the Medoc 2001 Chasse Spleen at only $97 per bottle—a rare find in Singapore. Apart from a specially curated list of 100 wines on rotation (with 75 varieties available at any time), varieties of cheese are also available for pairing. A retail shop with limited seating. Fun place. Always very crowded. Guests stand on the street. Citynomads.com: A new drinks concept has rocked up and gathered in the Club St business for its own. As a retail shop with limited seating, Drinks & Co sell wines by the bottle from as low as $16 and $10 by the glass. Bottles of spirits are also available for as low as $45. It’s home to bit of a banking crowd, and will be more of a brawl than having a chilled bottle of wine, but we can’t knock them for bringing the cheaper drinking experience to Club St.
USA Today 10 best: Get far from the madding crowds of Clarke Quay at this laidback little French bar on Ann Siang Hill, where traditional Chinese businesses and fancy new restaurants sit cheek-by-jowl in restored shophouses. With its distinct bistro feel — think French movie posters and lots of dark wood — you almost can't help but don a faux-French accent and ask the garçon for some of the escargots delicieux. Downstairs, there's even more of a homey feel with a pool table the center of attraction. A branch with river views recently opened at 41, Robertson Quay. Thedrinksbusiness.com: The Beaujolais Wine Bar was founded in 1988 and was designed with the aim of offering a wine and dine experience that was both familiar and homely. Serving a western European cuisine, Beaujolais offers dishes including cheese platters, bruschetta, goat cheese salad, sirloin and rib-eye steaks, alongside wines served by Master Sommelier Madeline Triffon. Ladyironchef.com: A fairly new entrant to the winery scene, Vida Vino (translating into “the wine life”) is about making merry without your wallet having to suffer. With a personal selection of 60 wines (by owner Aaron Olivera) that start from $12 per glass, this wine bar stands to give competitors a run for their money. The Beronia ($85 per bottle) is such—opening with subtle notes of flowers and fruit before blossoming into a refreshingly crisp and spicy finish, this wine pairs extremely well with the iberico ham platter ($23)—a range of Joselito iberico ham (the best in Spain). As for sipping cocktails, Vida Vino has done an exceptional job in crafting some pretty smooth-drinking concoctions. From Spain with Love ($18) consists of “secret ingredients” that results in an edgy, bittersweet cocktail—we managed to make out notes of Spanish white wine and raspberry brandy. Opposite to Vida Vino. Very lively. 2 locations. Hungrygowhere.com: Cosy wine and dine space in Keong Saik Road serving a expansive range of wine from the popular wine producing regions such as France, Italy and Chile. Promotions include “Buy 2 wines and get 1 free” and "Free flow of wine from 6pm to 8pm for $18". The events page of Praelum Wine Bistro is very Germany and Riesling centered, but the wine list was less so when I went there. Nevertheless, recent events include a visit of Ernst Loosen, Weingut Dr. Loosen, a visit of the German Wine Queen and Riesling Weeks. Thedrinkbusiness.com: Praelum was opened by wine aficionado Elizabeth Lin in December 2011 and is situated in the historic shophouse conservation area of Duxton Hill. Running the bistro is head sommelier and General Manager Gerald Lu, a certified sommelier and former head sommelier for the IndoChine Group of Restaurants. Its name, Praelum, means wine press in Latin – a device used to extract juice from crushed grapes in wine­making. Helmed by the Australian team Ainslie Kenny and David Elliott, Merchants Wine Cellar is a wine bar and wine store on Duxton Road that exclusively carries wines from Australia and New Zealand in its portfolio, focusing on talented, small, top-class wine producers. While I was in Singapore in October 2014, Merchants organized a winemaker dinner with Frank Butera, owner of and winemaker at Bass River Winery in Australia, which I was happy to attend. Thedrinkbusiness.com: Located in the trendy Duxton Hill area, Merchants Wine and Cellar Store is a shop, café and bar combined offering boutique wines, small plates, brunch and coffee. Wine is served from high tech wine machines on a rotation basis and winemakers regularly visit the shop to host pop-up tastings and wine dinners. A Weingut Robert Weil tasting was here, while I was in Singapore. Ambitious General Manager who wants to become a Master of Wine. Roosevelts.com.sg: Tucked away in a quiet corner of Tanjong Pagar, Roosevelt’s Diner & Bar is an eclectic modern diner that offers hearty all-day dining in a casual environment and at approachable prices. Our menu has a huge slant towards artisanal and gourmet fares, with our food, coffee blends, wines, spirits, and cocktails embodying this focus. The owners of Roosevelt’s have a portfolio of extensive F&B experience, including a French fine dining restaurant, Millesime, in Kuala Lumpur. Millesime is an award-winning restaurant, voted as one of Asia’s top restaurants by The Miele Guide, and having been rated as one of the top dining must-do’s in 2011 by Singapore’s Food & Travel Magazine. Today, the group owns more than five unique F&B outlets in Singapore and Malaysia. Citynomads.com: Chef Frederic Colin – the man behind Brasserie Gavroche that brought classic French fare to our tables, has done it again, this time opening a spanking new café right across the road from his brasserie. With Café Gavroche, he wants you to sit back, relax, and enjoy the tres Parisian culture of enjoying an aperitif, or a pre-dinner drink, in the company of good friends. Now who could possibly say no to that? A Weingut Robert Weil tasting was here, while I was in Singapore. We were then received by Fonz Row, the cellar master of The Vintner on Duxton, which is located in one of the coolest areas in town. The Vintner on Duxton: Fonz Row has been a professional wine merchant since 1997. His journey started in Canada and USA where he attained his accreditation from Culinary Institute of America - Certified Wine Professional. He remains an active Wine Critic in local and international wine events with a deep passion for boutique, cult vineyards and winemakers. Primarily top Italian restaurant, with a tiny bar. Extensive wine list with 250 bottles from Italy. 50 wine by the glass (enomatic machine). Hungrygowhere.com: Alba 1836 is a modern contemporary Italian Wine Bar & Restaurant conveniently nestled at Duxton Hill serving authentic Italian cuisine at its finest. Alba also offers a vast number of wines from all over Italy. The Wine Company has several outlets across the city from Dempsey to Sentosa. Place to enjoy some nice wining and dining, with wines starting at $6 per glass. TheWineCompany.com: Opened in Feb 2011, The Wine Company tm at Sentosa Boardwalk is a showcase of wine and its life-time partner, food. With distinctive Mediterranean accents, our wine bar and casual eatery offers tapas-style dishes such as fresh salt & pepper squid, or heartier options of ribeye with black pepper sauce. You can find a perfect pairing from our 300-label wine list or our house pour menu of over 40 options. Good wine and food puts a smile on our face each time; but what lifts our spirits and calms our souls when we are here is the beautiful sea view. Pick a seat at the al fresco area, spend an hour or two with us…and you will agree. Not a wine bar. The ala carte menu offers classic and tasting portions, with a focus on presenting premium ingredients in their simplest form to flesh out the essence of the produce.